As the father and son walked back to the parking lot after an amazing experience at Bristol Motor Speedway on Sunday afternoon, April 1, 1979, the nine-year-old first-time NASCAR fan, still trying to process all the action that had unfolded to him in a whirlwind of colorful sights and loud sounds, quizzed his father. "Did your favorite driver win today?" the son asked his dad, who was proudly covered from head to toe in green and white No. 88 Darrell Waltrip gear. "Naw, he didn't. He had a chance, but finished third," the father said, dejectedly. "Well, who was the winner of the race?" the youngster shot back, still trying to piece it all together. "Uh, it was some rookie driver," the dad said in frustration. "I believe his name was Earnhardt." Little did the pair know - or really anyone who attended the Southeastern 500 that day - that the race was actually the official launching pad for a driver who would become one of the most dominant, revered and greatest champions in Monster Energy NASCAR Cup Series history. The rookie winner that day at Bristol, 28-year-old Dale Earnhardt from Kannapolis, N.C., was a second-generation driver who was able to build his own cars, had cut his teeth on Carolina dirt tracks and was following in the tire tracks of his famous racing father Ralph Earnhardt. That maiden victory led to a championship title the very next season and a hall of fame career that produced 76 wins, including a total of nine BMS trophies, and seven Cup Series championships. Bristol Motor Speedway officials will celebrate that monumental moment in NASCAR history during the upcoming Food City 500 weekend, April 5-7, the 40th anniversary of Earnhardt's first Cup Series victory. A special tribute area commemorating the significant event will be constructed in BMS's vintage victory lane located near the BMS Hospitality Village for guests to enjoy with plenty of photo opportunities for their social media channels. Original photos from Earnhardt's 1979 victory will fill the two wings of the ceremonial winner's circle. As guests visit the area during the race weekend, they will be encouraged to sign the checkerboard Victory Lane floor. A key component of the tribute will be a special limited edition print of Earnhardt crossing the finish line that day captured in a beautifully-composed painting by noted motorsports artist Bill Patterson. A limited edition print of the painting will be given to the first 10,000 fans as they enter the gates on Sunday, April 7. Here's a closer look at the poster that each of the first 10,000 guests inside the gates at the #FoodCity500 will receive! In addition, the official Food City 500 commemorative program will feature a throwback '70s cover design in tribute to the Earnhardt victory and will include an in-depth cover story inside remembering that magical weekend by veteran NASCAR journalist Ben White. Come see this beauty on #FoodCity500 Race weekend where we will celebrate the 40th Anniversary of Dale Earnhardt Sr.'s First Career Cup Win. #ItsBristolBaby / #NASCAR / #ComeHome2Bristol Thanks to @championjc! 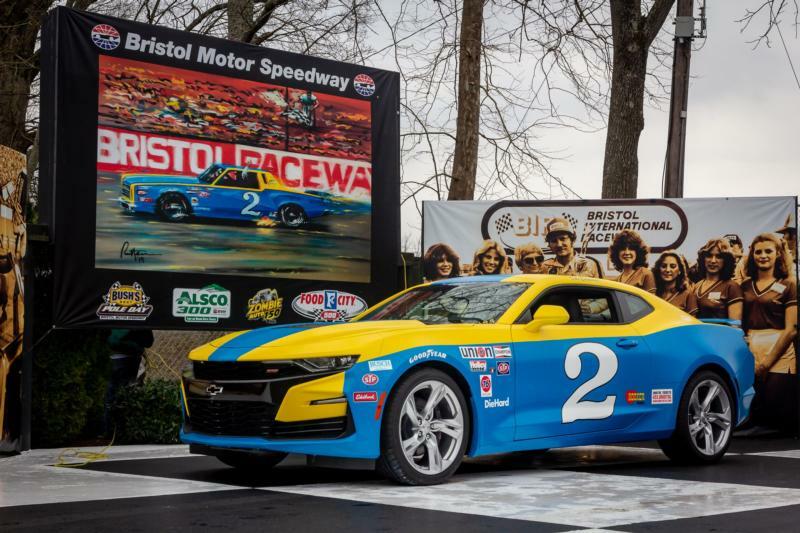 "We felt it was important to officially remember, recognize and celebrate that vitally significant moment in Bristol Motor Speedway history," said Jerry Caldwell, executive vice president and general manager, Bristol Motor Speedway. "On April 1st 1979, Dale Earnhardt - then a rookie - officially let the world know that he was going to be a major contender in the NASCAR Cup Series. What he accomplished that day is very special and remains the only Cup victory by a rookie driver in Bristol Motor Speedway history. We are proud to celebrate the 40th anniversary of that landmark victory in NASCAR history with all of our guests during the Food City 500 weekend." For those who watched closely that day back in '79, like his fellow drivers on the track, such as Waltrip, they knew immediately that the driver of the blue and yellow No. 2 Chevy Monte Carlo was different. He had special talents and was able to handle the car on one of NASCAR's toughest racetracks with the skill and flair of a seasoned veteran. To win a race back in those days and outrun some of the sport's kingpins like Cale Yarborough, "The King" Richard Petty, Waltrip, Buddy Baker, Bobby Allison and Benny Parsons, it took a really special effort. For a rookie to do it, well, that was an entirely different story. Back then, like today, it was a very rare thing for a rookie to earn a trophy during a Cup Series race. Especially a Cup Series race on the high banks of Bristol Motor Speedway. "Dale ran a great race that day in 1979 and I remember it because he beat me." Waltrip said recently. "He was good on the short tracks and had made a name for himself so everyone knew of him. He was with a bunch of young guys on that team under [crew chief] Jake Elder, such as Doug Richert and several others. "That day he stayed out of trouble in the car and didn't let anyone intimidate him." In only his 16th career Cup Series race, Earnhardt started ninth and took the green flag behind pole-sitter Baker and 28 other cars. Earnhardt led a couple of laps early on, but was quickly overtaken by Donnie Allison. However, Earnhardt wasn’t done. He hung tough as Waltrip led a bunch of laps. When Baker and Yarborough crashed out of the race around lap 143, Earnhardt surged forward. He moved past Bobby Allison to take the lead at lap 254 and stayed out front for 134 laps, to the amazement of both the fans and media in attendance. "At that point, he still had a bit of a chip on his shoulder," said veteran television and radio announcer Ken Squier. "He was one tough customer. He was absolutely determined to bring it home. Even though he could be a difficult soul at times, people understood that he was a real racer." Waltrip then reclaimed the lead late in the race and led for 85 laps until a caution at lap 473 sent the leaders into the pits for service and brought on another restart. That’s when Earnhardt beat Waltrip off pit road and held the lead from lap 474 to the finish. Bobby Allison finished second, followed by Waltrip, Petty and Parsons to round out the top five. While the fans and media were shocked to see a rookie visit Victory Lane at rugged Bristol, Earnhardt, while happy that his dream had come true, seemed right at home. "I’ll probably believe this in the morning," Earnhardt said in post-race interviews, as documented in the 40 Years of Stock Car Racing book series compiled and written by Greg Fielden. "This is a bigger thrill than my first-ever racing victory. This win was in the big leagues—the Grand Nationals. It wasn’t some dirt track back home." Allison said he respected Earnhardt for his tenacity and commitment to winning from day one, but like everyone else, didn’t think he’d see the No. 2 car take the checkered flag that afternoon. "That day, I don’t believe anyone really thought of Dale as a contender for the win," Bobby Allison said. "He had a really good car, but not the experience to do it so soon as a rookie driver. He surprised us all by staying in contention all day and led a bunch of laps. I was able to gain a few positions in the final 25 laps or so and got to second, but all I could do was watch him pull away at the end and take the win." Waltrip, who led 155 laps of the race and was the race’s defending winner, said that day clearly belonged to Earnhardt. It was his breakthrough coming out party and an indicator of greater things on the horizon for him in the sport. In two weeks, NASCAR fans will have their first chance to witness short track racing at its best and perhaps see the next Dale Earnhardt emerge from the pack. Chase Elliott, Martin Truex Jr., Kevin Harvick, defending champion Joey Logano, Kyle Busch, Brad Keselowski, Jimmie Johnson and Ryan Blaney will all be looking to take home the Gladiator sword from The Last Great Colosseum during the April 5-7 Food City 500 weekend. In addition to Sunday’s Food City 500, the event also will showcase a Saturday doubleheader with the Alsco 300 NASCAR Xfinity Series race and the Zombie Auto 150 NASCAR K&N Pro Series race. On Friday, the Cup Series stars will try to break the BMS track record of 131.668 mph (Denny Hamlin, Aug. 2016) as they qualify during Bush’s Beans Pole Day. Friday afternoon’s Food City Family Race night, held at the track, is one of the longest running fan events on the NASCAR circuit.